Here’s a video clip I’ve been meaning to share for a long while and just plain kept forgetting to. I have some behind-the-scenes details on this behind-the-scenes feature as well. – Jim Cummings (seen with his 80’s mullet-ish hair) performs Pooh, Jack Nicholson, Monterey Jack, and Fat Cat. – Tress MacNeille performs Chip, Gadget, Katherine Hepburn, and Joan Rivers. – Corey Burton (incorrectly identified in the video as “Cory Burton”) performs Dale and his spot-on impressions of Gregory Peck, James Mason and Professor Ludwig von Drake. – The late Hamilton Camp (voice of DuckTales character Fenton Crackshell/Gizmoduck) voices a supporting role from a Season 2 episode. Voice director Andrea Romano is also interviewed, and the video also offers a rare treat seeing Tress and Corey perform Chip and Dale’s voices before and after being sped up for their trademark chipmunky sound. It was an independent/Disney co-produced syndication “companion-piece” (called “Chip’n’Dale’s Excellent Adventure”; aired locally on then Disney-owned KCAL/channel 9) to promote the Rescue Rangers series, done at the start of the reorganized second season’s production run. The director would often be seated with us – for the rehearsal/run-through (which is seldom done anymore for an average TV cartoon session – Andrea, however, still does it all in that same classically professional manner for every show she directs, whenever studio space and time consideration allow); and after a break, we’d reassemble – with the director then working from behind the control room glass, from the engineer and producers’ vantage point. The standing lineup recording setup for that piece was “dummied” for the camera, with lines taken from a previously-produced episode (so they could intercut with existing animation); most of us sat in those chairs for the actual recording (there are always a few who insist on standing while performing – and they are perfectly welcome to, if that’s what they prefer). It was because of the interview cameras, in fact, that she was outfitted with the glamorous (but uncontrollably noise-producing) apparel and bracelets that were so un-self-consciously (and hilariously) cast aside for the actual recording session, which began once the cameras left. I was brought in by Disney Character Voices as a “specialist” (before actual production began) to reformulate the chipmunk voices for “limited” TV animation: They were originally special effects “chatter”, provided by female staff from Disney Studios’ Ink & Paint Department and secretarial pool, and part-time actresses (speaking mostly gibberish); until Jimmy MacDonald voiced them for Walt’s “Wonderful World of Color” featurette (where they compete to woo “Clarisse”). Because they needed to carry legible dialog now, we determined that a less severe speed shift could still sound “chipmunk-y”, and that the characters could be better differentiated if split between male and female performers doing “Little Rascals” style boy voices. I based Dale on Alfalfa Switzer, and borrowed from what Jimmy had done previously for TV. Tress based Chip on those early staff gals’ tone, delivered “in harmony” with my take on Dale. We had an extensive experimental session, until the right speed and characterizations were found, that everyone felt would work for the series. Incidentally, 2009 marks the 20th Anniversary of Chip and Dale’s Rescue Rangers (the series premiered on the Disney Channel March 5th, 1989), and we still have yet to see the DVD release of the remaining 14 episodes of this fan favorite animated series. If anyone from Walt Disney Home Entertainement/Buena Vista Home Video happens to be reading this, please give the fans some closure and help us complete our DVD collection and release the rest of the series on DVD and/or Blu-Ray. Or at least consider releasing a complete series box set with some actual bonus content — like the above documentary, new interviews with the cast and crew, and maybe a peek at the unreleased materials for the Rescue Rangers feature film that was originally planned for release in 1991. With it being the 20th Anniversary of the show, you’re missing out on a prime and timely opportunity to market and release a complete series box set and/or the Volume 3 release you still owe the fans. And for Pete’s sake — throw the fans a bone and include some bonus materials. The fans made your show a success — it’s the very least you can do for them in return. I believe I originally discovered this clip thanks to Kristy via the forum on Voice Chasers. And my thanks to Corey and other fans for their responses to my posting of this clip on the official Corey message board at CoreyBurton.com. Update: 8.30.2009 — I want to thank my fellow Rescue Ranger fans at The Acorn Cafe for their kind words about me and this article which I discovered while checking my blog traffic trackbacks. 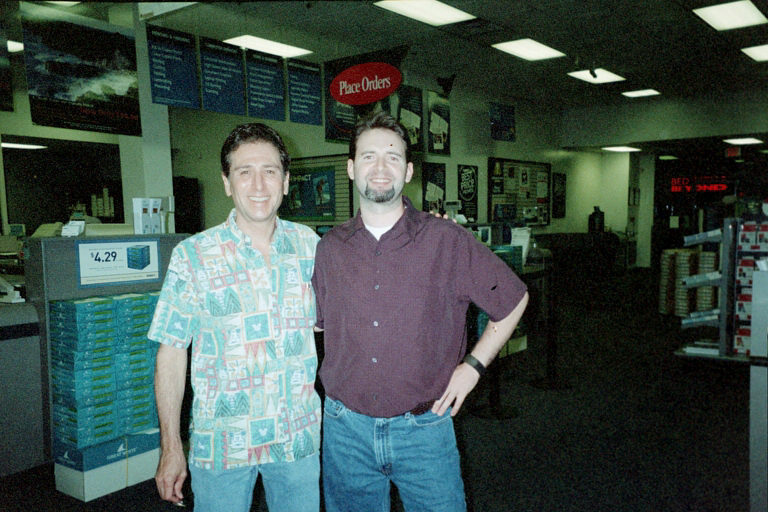 Corey Burton and Craig Crumpton pose at Kinko's in July 2003. This entry was posted on Thursday, August 27th, 2009 at 2:05 PM and is filed under Commentary/Op-Ed, Media: Audio and Videos. You can follow any responses to this entry through the RSS 2.0 feed. Both comments and pings are currently closed.